Inspired by the special exhibition New Ground: The Southwest of Maria Martinez and Laura Gilpin, we are celebrating famous artist friendships. Did you know that Loïs Mailou Jones (1905–1998) and Céline Tabary (1908–1993) were close friends who met in Paris before establishing art classes and a studio group in Washington, D.C.? 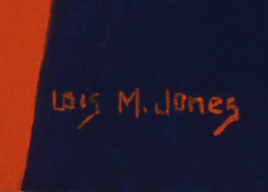 NMWA’s collection contains six works by Loïs Mailou Jones. Her colorful landscape painting Arreau, Hautes-Pyrénées (1949) was completed while the artist was on a sojourn in France. 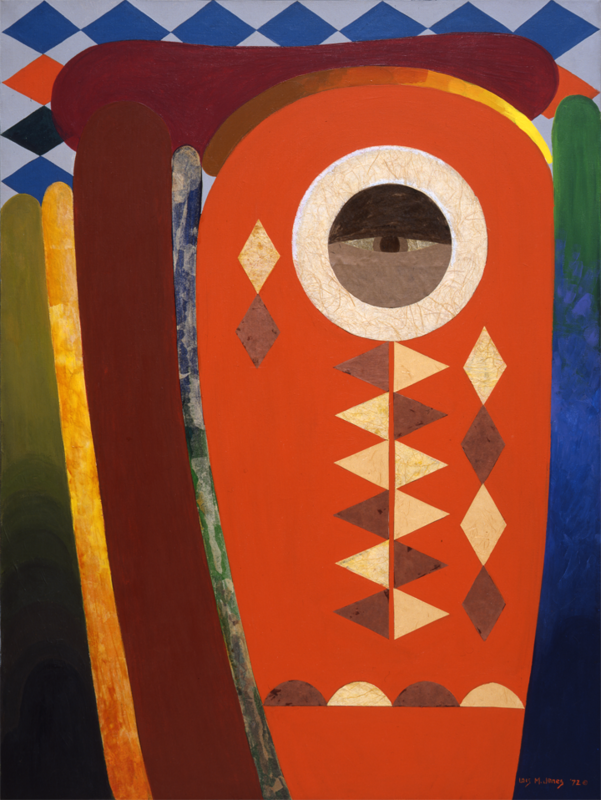 Other works by Jones are much more modernist in style, with bold colors and an African influence veering towards abstraction. Céline Tabary’s painting Terrasse de Café, Paris (1950) is also part of NMWA’s collection. Tabary painted in an impressionist style for most of her career, but Terrasse de Café, Paris reveals an emerging cubist influence. Little Paris in Washington, D.C.
Jones moved to Paris in 1937 to study at the Academie Julien. Jones fell in love with the French way of life and lack of racial prejudice, and was introduced to Tabary, a fellow student, when she needed help translating. The two became friends, and Jones visited Tabary’s family in the north of France. Jones considers paintings she did there some of her best. Jones returned to Washington, D.C. in 1938, and Tabary joined her, as they both planned to go back to France together. However, the start of World War II prevented their return, and Tabary and Jones continued working together in the United States and established Saturday morning art class for children as well as a salon style group to promote the artistic practice of public school art teachers. Alma Thomas, another prominent artist represented in NMWA’s collection, was also a part of the “Little Paris Group” run by Jones and Tabary. Learn about the friendship between potter Maria Martinez (ca. 1887–1980) and photographer Laura Gilpin (1891–1979), whose works are on view in New Ground through May 14, 2017. —Meghan Masius is the spring 2017 publications and communications/marketing intern at the National Museum of Women in the arts. Impress your friends with five fast facts about Loïs Mailou Jones (1905–1998), whose work is on view in NMWA’s collection galleries. Loïs Mailou Jones began her career as a textile artist, designing drapery and upholstery fabrics for prestigious firms in Boston and New York. She incorporated traditional motifs, such as flowers and leaves, as well as more unusual Caribbean- and African-inspired imagery, in her designs. Jones lamented that the design world was mostly anonymous: “[O]nly the name of the design printed on the borders of the fabric was known, never the name of the artist who created it. That bothered me because I was doing all this work, but not getting any recognition.” Consequently, she shifted her focus to painting—and signed every work. As a member of the art department at Howard University in Washington, D.C., from 1930 until 1977, Jones influenced several generations of African American artists, including Elizabeth Catlett, David Driskell, and Sylvia Snowden. Inspired by the Black Arts Movement, Jones documented contemporary African Diaspora art of Haiti, Africa, and the United States. She traveled to 11 African countries between 1970 and 1972, visiting studios and workshops, interviewing artists, and making thousands of slides of their work. These experiences also directly influenced the subjects and style of her future paintings. On her first trip to Paris in 1937, Jones began her lifelong friendship with French-born artist Céline Tabary (1908–1993). 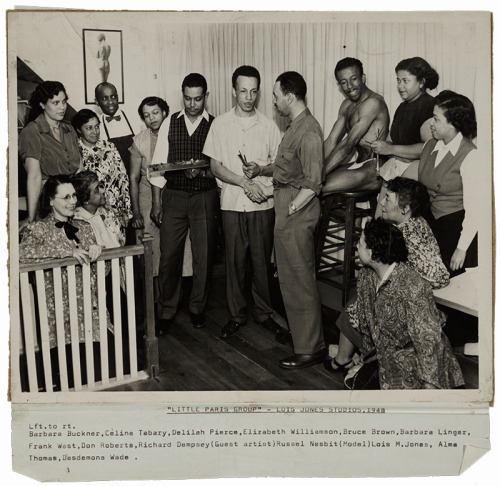 Tabary spent part of World War II living in Washington, D.C. During that time, she delivered Jones’s entry to the Society of Washington Artists exhibition at the Corcoran Gallery of Art because African American artists were forbidden to participate. ­­­­­­­­­­­­­­­­­—Deborah Gaston is the director of education and digital engagement at the National Museum of Women in the Arts.